We use the concept of a “soft” draft timer, which will countdown to zero, and give the commissioner the choice of allowing the CPU to make an educated pick, or enter a pick manually for the leaguemate who ran out of time. This is a much more flexible approach, in that if there was an accidental timing out (due to connection issues or otherwise), the commissioner can easily fix the issue by making a judgment call on what to do. 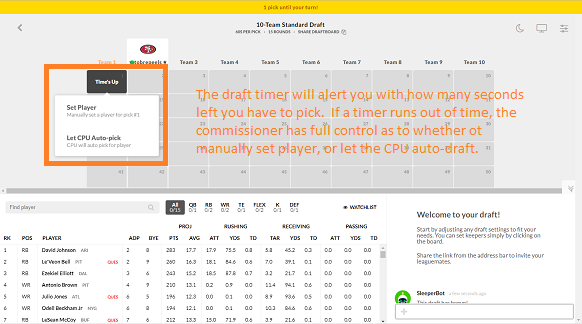 Commissioners can set the draft timer using settings > general draft settings > time per pick.